The recent proliferation of exhibitions organized around various Left political ʻismsʼ could be interpreted as a sign of the art worldʼs bad conscience. Or perhaps projects such as Communism at the Project Arts Centre in Dublin (20 January–12 March 2005) and Regarding Terror: The RAF Exhibition at Kunst Werke in Berlin (30 January–16 May 2005) are simply nostalgia for the cultural climate of the 1960s and 1970s and the legacy of conceptualism. There is certainly a growing tendency for curators to look back to those times in an effort to frame some present-day understanding of ʻthe politicalʼ in art. It is as if the institutional critique that was once dominated by issues of the production and distribution of art in relation to the white cube has suddenly been transformed into a critique and contestation of state power, at a global level, leaving few exhibitions free from being evaluated in terms of their political commitment. This approach involves reciting the aesthetic regime of conceptualism in the visual language of a once-upon-a-time real political radicalism. Yet in these aspirations for political enlightenment, something essential has been neglected. Many of these exhibitions fail, in Adornoʼs phrase, ʻto let nothing inherited go unchallengedʼ. This is not to say that there is an absence of works that claim to be new. But the failure of curators to look far into the complexity of works – in particular, in making visible processes of production – creates a sense that we are simply walking on the spot. Historically, Information, curated by Kynaston McShine at New Yorkʼs Museum of Modern Art in 1970, serves as a seminal example of how a curator focused on the presentation of new processes of production can challenge accepted artistic norms in relation to broader aesthetic and political aims. McShine included artists who invested cultural value in things that never previously had that kind of value. By using photocopies, documents, maps, sketches, surveys and instructions as a means of criticizing the built environment, the artists attempted to subvert the function of art objects within an emerging global capitalism. Adopting the logic of negation as an instrument of investigation and criticism of the positivist system of art production of the time, the works reacted against the afﬁrmative nature of art. Nearly four decades later, Populism, curated by Lars Bang Larsen, Cristina Ricupero and Nicolaus Schafhausen, uses the space of art to reﬂect on community and the idea of the social against the backdrop of vacuous populist agendas in which democratic jargon serves as a smokescreen for national chauvinist aspirations. However, in contrast to McShineʼs success in showing how art can serve as political critique, Populism remains unclear about how art might dismantle the illusion of political demagogy. Amar Kanwar, an artist working with themes of conﬂict and exile in India, Burma and Nepal within the medium of ﬁlm, had a similar question: ʻWould it not be possible to translate these aspirations for enlightenment not within the context of an international jamboree but to stage our resistance along the way through direct participation?ʼ Recognizing from the outset the projectʼs inability to dissipate the injustices it attempts to highlight, why do the curators remain faithful to the ʻreﬂexive critical potential of artistic works and their idealistic activist potential?ʼ In an exploration of the rights, laws and rituals endemic to capitalist democracies in Europe, the curators neither demystify the regimes of populist politics in Europe nor convey a sense of how these political tendencies have been transmitted into art, other than simply by mirroring their agendas. The curators of Populism express an aspiration to illustrate how the ʻaffects and desires that characterize populist politics in art are not necessarily separate ones that ﬁnd expression in the sphere of artʼ. The curatorial statement reads: ʻone ﬁnds dreams of direct democracy through immediacy of collective participation (the big nineteenthand twentieth-century promise of art: that it could beam its pledge of togetherness across the arts, industry, and science to bring about a new social body).ʼ Despite the integrity of its intention, the project fails. It fails because it has neglected to understand that art, be it in the form of the literary movements of the nineteenth century or in the more critical works of today, is not about the formation of a new social body, but about the dissolution of the social body and the social bond. Political critique may involve illustrating what we already know, but it reveals the complexities of an apparent surface, and also of its apparent critique. This is best exempliﬁed by an artist like Haroun Farocki, who uses montage and editing techniques to review documentary ﬁlms in an effort to reveal how media depictions are ﬁctional constructions. It is insufﬁcient to reduce our understanding of a political work to a series of effects or even to ornament – as in the inﬂatable sign extolling TERROR produced by Dutch artist Marc Bijl, whose work was naively included in the exhibition, perhaps to illustrate how popular sovereignty unleashes a host of evils. Would it not be more effective, as someone from Oslo suggested, to screen footage from last summerʼs Tour de France in which Lance Armstrong was spat at by hundreds of onlookers as he forged his way ahead through the crowds? In this sense, Populism is guilty of what Adorno called ʻpremeditatively programmaticʼ collectivity. As an exhibition, Populism also succumbs to what Adorno identiﬁed as the tendency of all ʻismsʼ: ʻto emphasize conviction and intention, to expel the element of involuntariness from artʼ. The curators missed an opportunity to choreograph another kind of exhibition that would have reconﬁgured accepted cycles of representation. Why is it that Matias Faldbakken was asked to participate with a static wall painting, rather than to engage with his work as an author and satirist? In the critically acclaimed Scandinavian Misanthropy 1 & 2: The Coca-Hola Company and Macht und Rebel, written under the pen name Abo Rasul, Faldbakken sardonically approaches the culture industry and its modes of production to produce ﬁctional satire that merges image and text. In The Coca-Hola Company, a small pornographic enterprise serves as a base for anti-conformist political activity, and in Macht und Rebel a frustrated left-wing radical and an advertising executive share a disdain for countercultural movements and the mediocrity of the mainstream. In these and other written works, Faldbakken creates commonplace characters that cross over from literature into visual art to challenge the reappearance of ʻismsʼ in present-day cultural production. 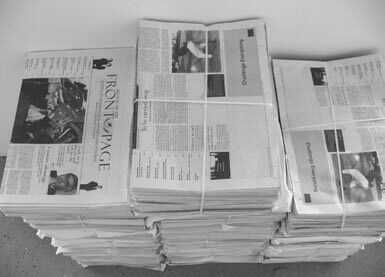 For a recent exhibition entitled START KAPITAL, which dealt with the theme of bankruptcy in a newly opened commercial gallery – STANDARD (OSLO) – Faldbakken produced a newspaper with the masthead SEE YOU ON THE FRONT PAGE OF THE LAST NEWSPAPER THOSE MOTHERFUCKERS EVER PRINT. Following a logic of contradictions inherent to the existing social, economic and political order, the newspaper contains idiosyncratic articles such as ʻZero Tolerance: A Wave of Conceptual Vandalismʼ, ʻRead Between the Lines: In a Modern Wayʼ, ʻDeﬁnition of Self: Microsoft on Microsoftʼ, and ʻSocial Insects: The Police State/The Anarchic Syndromes of Bee Hivesʼ. Through an interplay of images and signs, Faldbakken reconﬁgures the perceptual form of the newspaper by fabricating stories that abstract from the state of the world. As such, he enacts Rancièreʼs vision of ʻdeﬁn[ing] models for connecting the presentation of facts and forms of intelligibility that blur the border between the logic of facts and the logic of ﬁctionʼ. If there is one work in Populism that illustrates the relationship of populist politics to contemporary art, it is the video documentary by Nicolas Tremblay about a project realized by Thomas Hirschhorn at the Centre Cultural Suisse in Paris. Swiss Swiss Democracy is an exhaustive memory of an exhibition as a political statement against the state of affairs in the artistʼs home country – a protest against the election of Christoph Blocher to the Federal Council of Switzerland. Having refused to participate in any exhibitions in Switzerland, Hirschhorn used the opportunity to pose questions about the state of democracy, transforming the space of the exhibition into a forum mimicking the chaotic format of his previous installations to include a lecture by the philosopher Markus Steinweg and a play by the Gwenael Morin Company, based on William Tell, the mythological founder of Switzerland. The Swiss government, ﬁnding the initiative a misuse of state funds, cut approximately a million Swiss francs from the annual budget of Pro Helvetia, the foundation for visual art. At one level, Hirschhornʼs project rendered transparent the aims of state funding agencies that support programming that promotes populist agendas. At another level, the documentary Swiss Swiss Democracy serves as both artwork and archive documenting how the space of exhibition can be transformed into a sphere of action which criticizes the funding mechanisms that serve to fuel the global tourism industry. Although not itself a work of art Be What You Want But Stay Where You Are, an exhibition curated by Documenta curator Roger Buergel at Witte de Witte, attempts to show how art involves ʻa set of actions that acts upon other actionsʼ. It shares Populismʼs concern with government and models of community, but it articulates it more coherently. The works support a collective idea: they are less viable in their own right but function through their relations to one another. Resisting the temptation to make a grand statement about Europe, Buergel concentrates on creating a modest ʻgroup portraitʼ. The presentation of works is formal and reductive, using strategies central to conceptualismʼs aesthetic regime. Resisting the formulaic tendency to discount matters of presentation for works that are socially and politically conﬁgured, Buergel concentrates on ways to re-engage ʻartʼs capacity to act only through the aesthetic processʼ. The show departs from a Dutch group portrait from the so-called Golden Age, not just as an egalitarian model of community, but as a recasting of sensible form. Buergel proceeds to convey a ʻspace of art as a space of actionʼ that is mute but effective in redirecting our attention back to content. A backlit slide projection, Parallax, by Andrea Geyer, revolving around themes of city, nationhood and citizenship, is particularly poignant. Like other works in the show, it approaches artistic practice, if not by refocusing on processes of production, then by entering the ﬁeld of the political through aesthetic possibilities that prompt one to listen, rather than simply to watch.